(Scott Sommerdorf | The Salt Lake Tribune) Utah Utes guard/forward Daneesha Provo (23) shoots a first half free throw. Oregon defeated Utah 84-68, Sunday, January 28, 2018. 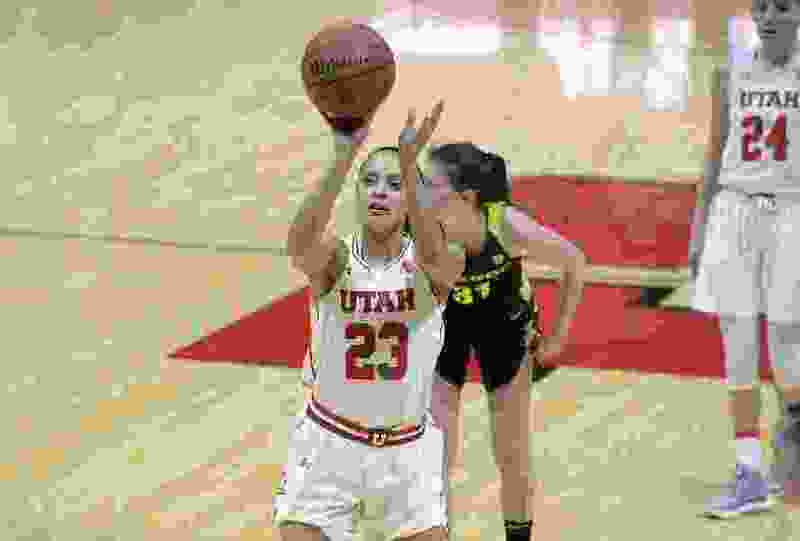 Ever since women's basketball practice started in September, any discussion of Utah's team has featured two distinct groups: the seniors and the freshmen. The roster has a gap between those two classes, partly explained by two key freshmen having redshirted last season, an injury to a sophomore and some attrition as coach Lynne Roberts has established her program. Allowing for the contribution of junior guard Kiana Moore, the Utes will go as far as their seniors can take them in 2018-19 — with the freshmen needing to come along quickly, as Utah opens the season Wednesday at Nevada. Now in her fourth season, Roberts arrived at Utah with credentials as a program builder. It took her three years to make Chico State a Division II power and six years to turn Pacific into a Big West contender. She would love to accelerate that timetable with the Utes, although breaking into the top four in this conference would be quite an achievement for the program, whenever that happens. The immediate question is whether the Utes can rise above eighth place, where they finished last year and where they're picked this season. Three seniors will do the bulk of the pushing this season. Forward Megan Huff is an All-Pac-12 player who averaged 14.7 points and 7.8 rebounds last year for a team that finished 18-14 overall, 8-10 in the conference. Another forward, Daneesha Provo, is the team's most dynamic athlete and a good 3-point shooter. Guard Erika Bean has started 61 games in her career. The Utes also have shooting specialist Sarah Porter, a graduate transfer from UC Santa Barbara. The Utes showed that new style in a 118-80 exhibition victory over Westminster College. They ran and pressed, playing fast and aggressively. Redshirt freshman guard Dru Glyten thrived in that approach. Her 16 assists would have been a school record in a regular-season game. The pace “takes so much pressure off your offense,” Provo said. True freshmen Dre'Una Edwards and Andre Torres scored 20 and 12 points against Westminster, and redshirt freshman Jordan Cruz also was in the rotation. The Utes hope to do more of that in 2018-19, blending the old and the new. Wednesday – at Nevada, 7:30 p.m.
Nov. 13 – Alabama, 7 p.m..
Nov. 16 – Long Beach State, 7 p.m..
Nov. 19 – Idaho State, 7 p.m..
Nov. 21 – at Eastern Washington, 5 p.m..
Nov. 26 – Seattle, 7 p.m.
Dec. 1 – Utah Valley, 5:30 p.m.
Dec. 8 – BYU, 7 p.m.
Dec. 15 – Weber State, 2 p.m.
Dec. 20 – vs. Florida at Las Vegas, 1 p.m.
Dec. 21 – vs. Hawaii/UNLV at Las Vegas, TBD. Dec. 30 – at Colorado, 1 p.m.
Jan. 4 – Arizona State, 7 p.m.
Jan. 6 – Arizona, noon. Jan. 11 – at Washington State, 8 p.m.
Jan. 13 – at Washington, 3 p.m.
Jan. 18 – Colorado, 7 p.m.
Jan. 25 – California, 7 p.m.
Jan. 27 – Stanford, noon. Feb. 1 – at Oregon, 8 p.m.
Feb. 3 – at Oregon State, 1 p.m.
Feb. 8 – USC, 7 p.m.
Feb. 10 – UCLA, noon. Feb. 15 – at Arizona, 6 p.m.
Feb. 17 – at Arizona State, 2 p.m.
Feb. 22 – Washington, 7 p.m.
Feb. 24 – Washington State, noon. March 1 – at UCLA, 8 p.m.
March 3 – at USC, 1 p.m.
March 7-10 – Pac-12 tournament, Las Vegas.